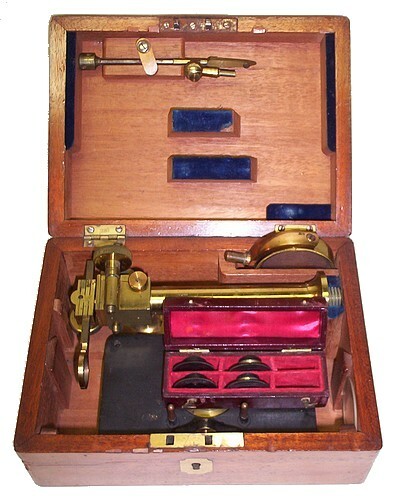 The instrument shown here is supplied with four objectives which are stored in a leather covered box, a stage forceps, and a glass stage insert. The following was extracted from the book: a Practical Treatise on the Use of the Microscope, by John Quekett, 1848. 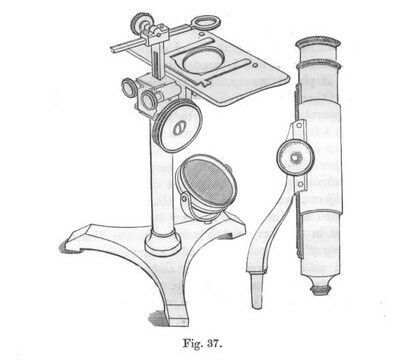 A very useful single microscope is that made by Mr. Ross, and described by him in the Penny Cyclopedia, article, "Microscope." It is represented by fig. 37, and consists of a brass pillar,about six inches long, screwed into a tripod base; to the upper part of the pillar is attached, by screws with milled heads, large flat stage, provided with a spring clip, and other apparatus for holding the objects. By means of the large milled head, a triangular bar, having a rack, is raised out of the pillar; this bar carries a lens-holderd having a horizontal movement in one direction, by means of a rack and pinion, and in the other direction, by turning on a circular pin. It is also provided with a concave mirror, for reflecting the light through the hole in the stage, a condensing lens, for the purpose of illuminating opaque objects, and a pair of forceps for holding small objects, may be applied to either of the holes in the stage. 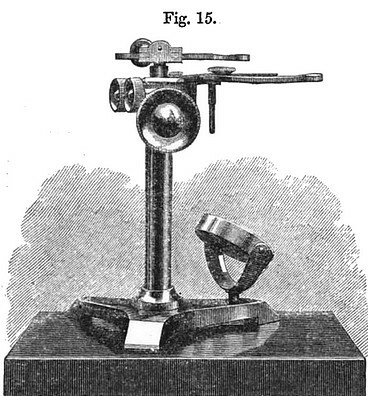 This microscope is usually supplied with lenses of one inch and one half-inch in focal length for dissecting; but the higher powers generally employed are either doublets or triplets; or this instrument may be converted into compound one by taking away the lens-holder and substituting for it the compound body represented on the right of the stand, and when provided with a cradle joint, either at the top or bottom of the pillar, may be inclined after the manner of the larger compound instruments, which are to be presently described. This microscope, with its broad stage, is well adapted for minute dissections, and is rendered more convenient for the purpose if placed between the two inclined planes, to be hereafter mentioned, which form what is called the dissecting rest. This apparatus gives support to the arms, and brings the wrists on a levels with the stage, whereby small cutting instruments can be managed with the greatest nicety. Dissecting Microscope.—There are many different sorts of dissecting microscopes, which vary according to the fancy of the makers; it will be sufficient but as the principle of all must be the same, to refer to the accompanying fig. 15, which represents one of the best construction by Mr. Ross. The principal points to be attended to in selecting a dissecting microscope are to see that the stage is of sufficient size and strength, and that the arrangements for holding the lenses and moving them in different directions, are convenient. In the instrument in fig. 15, the arm at the top which carries the lens-holder has a forward motion by rack and pinion, and a traversing motion on a pivot, by which means the lens can be carried in any direction over the stage. The adjustment of the focus is effected by the large milled head at the side. This instrument is usually furnished with lenses of 1 inch, 1/2 inch, 1/4 inch, and 1/10 inch focal lengths, and sometimes with a Wollaston’s doublet. The doublet may well be dispensed with, if the observer is possessed of a compound achromatic microscope. 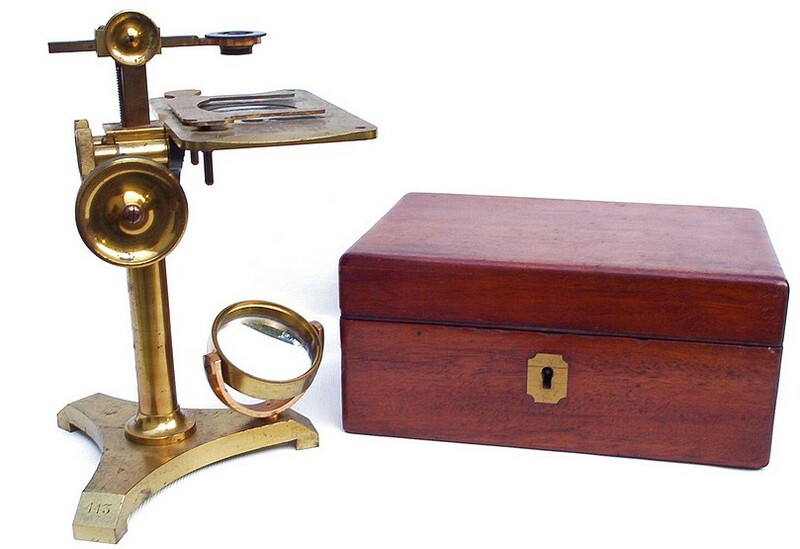 In carrying on delicate dissections with this microscope, it is advisable to make use of the armrests, which will be described hereafter in the chapter on accessory instruments. Mr. Ross’ 1 inch achromatic object-glass may be used in dissecting with this instrument, and will be found most agreeable.